If you’ve been struggling with paying down your student debts, you may be able to find some relief with student loan refinancing. Refinancing your private and federal student loans offers a number of benefits, including lowering your interest rate and monthly payments. But before starting the student loan refinance process, it is important to understand whether you are eligible to refinance, the financial pros and cons, the interest rates to expect, how to compare potential lenders and their loan approval rules, and finally, how to begin an application. When it comes to refinancing student loans, you may have any number of reasons for moving forward. For instance, you may currently have a high rate of interest and are seeking to lower your interest rate. This, in turn, can end up also lowering your monthly payment, along with decreasing the total amount of money (interest) that you repay over time. For example, the average student debt is approximately $35,000. If your current loans charge a 5% interest rate and the term period is 10 years, then your current payments are roughly $373 per month and you will eventually pay close to $9,500 in interest. However, if you were to refinance your student loans to just 3% interest with no origination fees, then your new monthly payment will be close to $338 with only $5,560 in interest. Ultimately, refinancing would save you almost $4,000 in interest expense – money that could pay off other debts or be used to invest. You may also want to simplify your repayment process. If you have several different student loans now – all with different payment amounts and schedules – a refinance could mean that going forward, you will only have one payment and date. This happens because a refinance could also double as a consolidation. Finally, if you were required to have a co-signer on your student loan(s), then you may want to remove that individual from the loan. Refinancing will mean that the co-signer, most likely your parents, is relieved from their potential obligation. But, it can also mean that you and you alone must be able to qualify for and repay the newly refinanced loan. A job with income that is sufficient to pay your new student loans and other living expenses. Proof that you are a financially responsible borrower with a record of making on-time payments. Proof can come in the form of a good credit score or a history of no missed or late payments. Just remember, federal student loan consolidation and refinancing programs are free. This means that these programs, even though issued by private lenders, are also typically without application or loan origination fees, as the loans are backed by the federal government. Conversely, private student loans are not guaranteed by the government, and are therefore typically not free. In most cases, private student loans will be dependent upon the borrower’s credit. Because of this, some private student loan borrowers may need a cosigner in order to refinance their student debt obligations. The interest rate and other terms that are given to a borrower (and their cosigner, if applicable) will also depend upon the monthly income that is earned by one or both parties. There are, however, ways in which one may remove their loan cosigner after a certain amount of time has passed in which on-time loan repayments have been made. 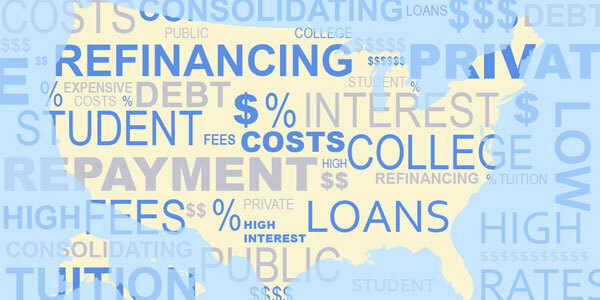 There are a number of potential benefits to refinancing one’s student loans. Oftentimes, the borrower can lower their monthly loan payments, meaning more cash in their pocket each month that can go towards other financial obligations. Depending on your reason for the refinance, as well as the available lenders and their offerings, it is essential that you consider the pros and cons. You may be able to lower your monthly payment without even lowering your interest rate. This happens when you decide to lengthen your loan’s repayment term period. While a 5 or 10 year loan can be extended to 15 or 20 years, this also means you will end up paying back more in terms of total dollars over time. So it’s only a win-win if you can lower your payments with a lower interest rate. As mentioned earlier, a reduction in the interest rate charged can make save you thousands of dollars on your student loans. Generally speaking, if you can’t get a substantially lower interest rate on a refinanced student loan, then the process isn’t offering the maximum benefits. Whether it’s your credit score, a recently missed payment, or mediocre lending offers, you should likely wait till you’ve maximized your potential refinancing terms and conditions. In some cases, you may be able to get a discount on your private student loan payments if you sign up for automatic debit. So, be sure to inquire about this, as any type of discount could help you to reduce your new loan payment even more. In going forward, there are also some key factors to consider with regard to your current student loan. For example, if you are considering the refinance of a federal student loan, you should ask yourself if you plan to take advantage of any potential loan forgiveness programs in the future. By going with a private loan, you may end up losing your ability to obtain extended or income-based repayment and the option to temporarily defer your loan(s) interest-free. You should also find out how – or if – you can postpone your private student loan payments for a period of time if you should become unemployed in the future. In some cases, a private loan may have more restrictions than a federal student loan. Similarly, understand if, and how much, interest will accrue during the time that your refinanced loan is being deferred, if applicable. Finally, while nobody likes to think about not being able to keep up with their loan payments, it’s critical to research what happens if the newly refinanced student loan ever goes into default. How much do you owe? In some cases, a private lender may require that you have a certain minimum amount of current outstanding loan balance. If your loan balance is too low to meet the minimum requirements, you may instead want to consider simply paying off your student loans faster so that you can completely wipe out the debt. Are your loans in good standing? In order to be eligible to refinance your student loan, your account must be in good standing. This means that you are current on your payments and that the loan has not gone into default. What is your credit score? As with most other types of loans, your credit score will be an important factor in determining whether you are eligible to proceed with the refinance. In determining your credit score, the credit bureaus will take into account several criteria. These include whether or not you pay your bills on time, how much total debt you are carrying, what type of debt you have, the length of your credit history, and how much in new credit you have recently applied for. Is your income steady? If you are working full-time, and you have a good, steady income, you are more likely to qualify for refinancing your student loan(s). This is because the lenders will view you as less of a risk. Details regarding your current student loans. The new lender will need to know the type and the amount of the loan(s) you plan to refinance. Your credit score. Typically, in order to qualify, you will need to have a credit score that is in the high 600s. The lender will pull a credit history to verify. Your income. The lender will also want to know that your income is enough to afford the monthly repayments, as well as other debt that you may have. Once you have been accepted for a student loan refinance, the new lender will pay off your existing loan balances, and then issue you a new loan. Going forward, you will start making payments to the new lender. By refinancing your student loan(s), you may be able to save a great deal of money in interest – especially when calculated over the lifetime of your loan. If refinancing your student loan is the right option, then the next step in the process is to apply with a lender. Once you apply for your refinance loan, the lender will perform a credit check in order to determine your credit score. The lender will also verify your income with your employer. If you are qualified for the new loan, you will typically receive an offer from the lender, along with notification of the new loan’s interest rate and terms. The interest rate on your refinanced loan will be based on your overall financial health and your credit. As you go forward with the loan refinance process, be sure that you know exactly when your first payment will be due, as well as when your payments are due each month. You will also need to know the amount of your monthly payment. In addition, you will want to get information on how you may be able to pay more than just the minimum amount of payment each month, if you choose to do so. By going that route, you will be able to pay off your new loan early, and potentially save yourself hundreds or thousands of dollars in the process.